*Enterprise Edition customers use our Tasks feature rather than Reminders. Tasks are an extension of Reminders and allows user to assign and manage Tasks for themselves and other users. Reminders are a great way to stay on top of follow ups with tickets. Simply add a reminder and an email will be sent to you on the due date. 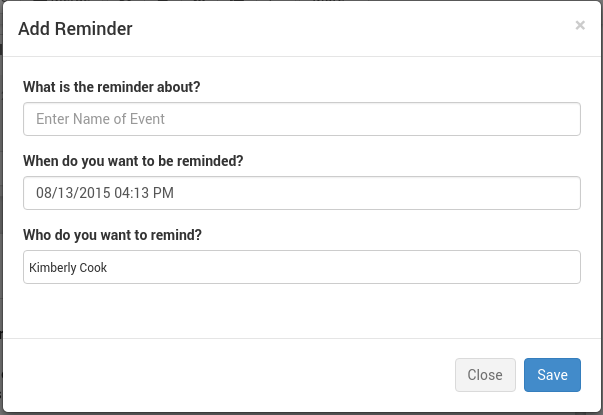 You can also add reminders for customer accounts and individual contacts. Click here to learn more. Reminders for Tickets and Customers are displayed on applicable Calendar views. To add a reminder on a ticket, open a ticket and click “add” under the Reminders section on the right. The following form is displayed. Fill in the form and click OK.
You can view the reminders for tickets on the right hand side of the Ticket Detail window. You can also view and manage all of your Reminders in the My Tickets section under the Reminders tab.